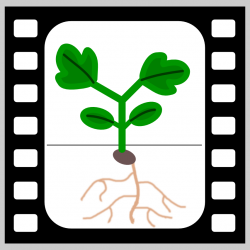 Time-lapse video of multiple radish seeds germinating, showing both root and shoot growth. The brown background is tissue paper, which incidentally is much too thin for this sort of thing. Thus, some of the plants actually ended up growing behind it. My favorite part is watching the lateral roots form. Video is 30fps, 1 frame per 20 minutes of growth. The ‘breathing’ at the end is a result of the grow light being on a 10on/14off hour cycle.